Becky has been painting and drawing most of her life. She loves capturing the vibrancy of color, light and form. Becky loves the spontaneity in her style of painting; being in the moment … to her painting is the closest thing to being in love. For Becky, painting abstractly is so freeing, and lets her explore endless possibilities, which is what she loves about painting in general – that there are so many options and mediums. Becky also teaches and loves inspiring others to realize their creativity, encouraging others to explore their creativity with art. For Becky, her art is life-long process of growing, learning and exploring. I think it was when I was in junior high school (called middle school now). I had an art teacher that I just loved and he encouraged me so much. That was a new experience, and it made me realize how important art was to me. I would describe my art as multi-faceted, loose, energetic, yet often soft. Well, until recently it was a very large and long room with lots of shelves for storage, a huge flat file and a couple of work tables. It might look a little messy, but for me everything was very organized and I knew where everything was. I cannot start painting in a mess, it has to be organized and cleaned up before I start. However, things are transitioning in my life and we are getting ready to rent our home and spend an extended period of time in Europe, so my work space is a table and my easel set up near a sink and shelves in the garage. For now, it works. Before I start any painting, my space must be neat…then I usually do a little ritual, light incense or a smudge stick, loosen up my body, check in with myself/higher power/muse, maybe meditate. Often I light a candle. I’ve collected elements from nature that I connect with also. That being said…for abstracts, I like to just get out my substrate and start putting paint and marks on it with colors I’ve chosen that speak to me in the moment. I’ll let it dry, rotate the canvas and begin again with another layer. I repeat this as often as necessary until I feel I have a finished painting, using many different tools, including my fingers, which I use a lot. I love painting with my fingers! The painting may end up looking completely different from where it started, as I just let my intuition guide me. I mostly do not start out with any ‘idea’ of what I’m painting, but every now and then I do. With landscapes, it’s a little different…it’s more planned. I’ll usually do a value study (notan) and a color study to get my values and colors right. That it is yours and yours alone to experience. That the worst you can do as an artist is compare yourself to others. That ultimately my sole purpose for painting is for myself. I will try a new tool, new materials, a new technique, a new strategy. I will go really wild and just use wild colors or very broad, thick strokes. I also have many classes I’ve bought or subscribed to online that I can go to…classes really help get me unstuck. Taking myself off the hook as far as having to market and promote. That’s where I’m at currently. Previously, a huge hurdle was when I quit comparing myself with others and let whatever I wanted to paint be ok.
Carrie: For a time, you participated in the first incarnation of my mastermind program The Circle. What drew you to joining The Circle? It was you, Carrie, and the community you started with that. I found you (and them) to be so loving, easy, forgiving, accepting and vulnerable. It would have to be acrylic paint. You can paint on anything and with any tool. Flora Bowley ****** LOVE her. Being willing to let go, be in the moment, listening to your inner voice (or not if you can’t find it), and just letting yourself be open to what comes up. This can be about anything in life, not just painting. 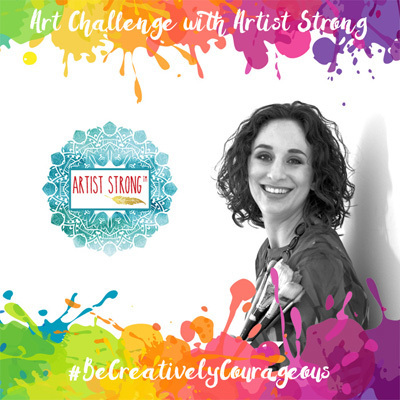 Be Creatively Courageous: What is one takeaway you have from Becky’s work? What is one lesson you can apply to your own art?